Looking for a great shakeyhead, STC has it. Great for Case drop shot worms, STC rib worms and other small worms and creature baits. 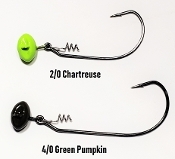 Use these for swimbaits, beavs, grubs and other soft plastics. Use these for Case Magic Stiks with the O Wacky Tool. Use for creatrue baits, swimbaits and other plastics for a dragging on the bottom presentation. Used for stand-up soft plastic presentations with the best keeper on the martket. Need a gret jig head for your ned rigs, we got them. Great for weedlesss, leaveless and when you have a lot of vegetation and wood. Finesse fishing will never be the same with our new e2 Shakey Head advanced stabile football head. Finesse fishing asmall worm or craw on light line allows you to focus on finicky, non-aggressive bass.